Leo Payne is the type of driver every fleet wants. He’s dedicated, hardworking, but above all else, he’s a team player. 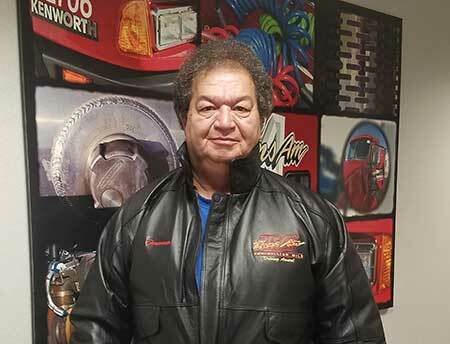 Leo joined TransAm Trucking in 1997 as a company driver and he’s still with us today. His safety record is impressive (he is consistently a DriveCam Top Performer) and his miles are even more so. Leo Payne reached his 2 Million Mile mark with TransAm! That’s an average of 288 miles a day! But Leo isn’t only a driver. He’s also a TransAm representative. Truck drivers spend a good part of their work day in their trucks. But truck driving isn’t as isolating as you may think. Each time a driver gets out of the truck there is someone new to meet. From shippers to lumpers to truck stop attendants, drivers are representatives of their companies. Leo Payne takes it a step further. He also visits trucking schools to talk to new drivers about the trucking industry. He answers questions and gives valuable insight to new drivers on what it means to be a driver. He’s helping other drivers succeed. Leo Payne has a very accomplished driving career. Not only has he driven over 2 million miles all over the USA but he’s also taken time to pass on his knowledge to new drivers. Thank you, Leo, for being a part of the TransAm Team! Congratulations on your 2 Million Mile Achievement!